Description: Bejeweled with lovely clusters of faceted crystal glass beads that emanate brilliant radiance and luxury for any setting. 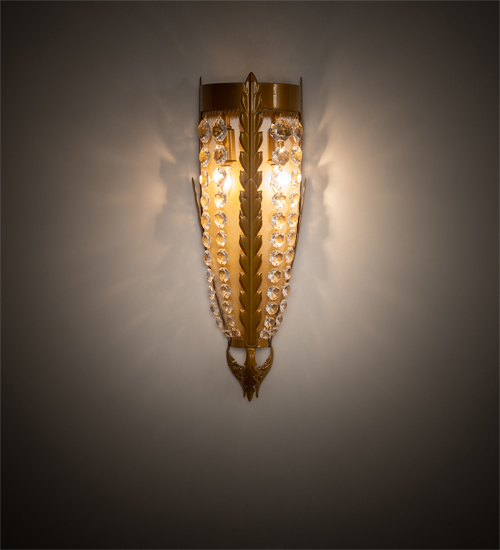 This elegant wall sconce features Transparent Gold finished leaf accents and hardware. 2 customer supplied E12 base 6-watt LED lamps deliver energy efficient illumination. Custom crafted by highly skilled artisans in our 180,000 square foot manufacturing facility in Yorkville, New York. Custom styles, designs and sizes are available. UL and cUL listed for dry and damp locations.